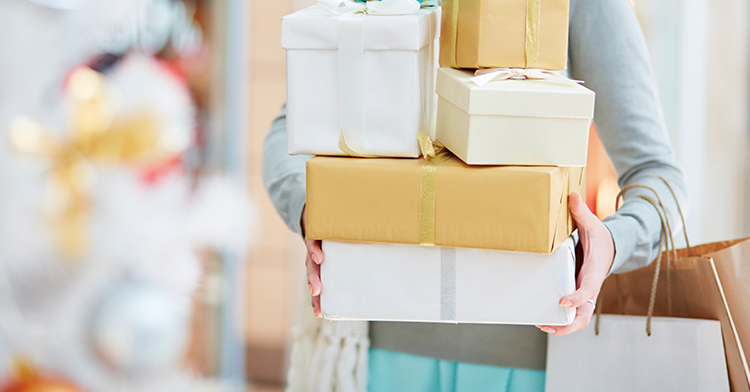 Remember last Christmas when you really hit your shopping stride? You had your wallet in one hand and 14 bags in the other. You were having so much fun you spun ‘round and ‘round right there in the food court like Buddy the Elf. Fueled by the four food groups of cinnamon rolls, coffee, tacos, and Chinese food you shopped until you dropped. And boy, did you drop. Waking up from a sugar coma, you felt what we all feel after a day of holiday impulse buys: regret. Overspending might have put you on the naughty list last year, but thankfully there’s room for everyone on the nice list this year. Follow our tips for avoiding impulse buys and you’ll be able to shop happily, give generously and best of all, sleep peacefully. You guys know the drill. With your EveryDollar budget, you already give every dollar a name before the month begins. Same idea here. Determine how much you can afford to spend this Christmas and divide that amount by the number of people you plan to buy for. Make your list, check it twice. But wait! Don’t head out just yet! Instead, evaluate yourself. If you think you might give in to temptation anyway, build an impulse buy into your budget. Give yourself $20 in cash to spend as you please while shopping. Maybe you’ll grab a cup of coffee, an irresistible scarf, or another small treat—all guilt free! But just remember: When that cash is gone, it’s gone for good. Budget in hand, you’re ready to plan your shopping spree. Take a look at your list to determine which gifts might be best bought online and which ones you’d prefer to pick up in store. Where should you shop? If the item on your list is vague or general—cute sweater for my niece, Ella—you might want to browse a few stores to get a feel for what’s out there. Otherwise, try looking around online first. Many shops offer great deals online during the holidays, including storewide sales and free shipping. Plus, think of the impulse buys you won’t make simply because you stayed out of the store! As you head to your computer or out the front door, keep these strategies in mind so you don’t act like a “cotton-headed-ninny-muggins” while shopping (that’s Elf talk for “overspender”). Remove the one-click option. That’s right, folks. Make it a little less convenient by forcing yourself to go through the long process of placing an item in your cart and reviewing the details every step of the way. Walk away from your computer before making a purchase. Each time you find exactly what you’re looking for (go you! ), get up and walk away for a moment. Use the restroom, call your mom, or grab a glass of water. When you sit back down, see how you feel. Does it still feel right and fit the budget? Buy away! Imagine yourself having to return the item. Consider the store policy. Will you have to print a label, pack a box and make your way to UPS during the busiest time of the year? Decide up front if this gift is worth the risk of returning. Give yourself a cutoff time. When you’re shopping from home you could actually shop until you literally drop. Don’t do that. Set an alarm on your phone and commit to stopping when it goes off. The internet—and all its options—will be there tomorrow. Bring a friend along. Be social while you shop. Your friend can be an extra set of eyes for gifts on your list, help you decide which color headphones you should snag for your son, and tell you when to put the purple cowboy boots back—after all, a good deal is a bad deal if no one will wear them! Make a wish list. When you see something you want for yourself, check your budget. Does it fit what you’ve got left in your impulse-buy category? If so, go for it. If not, add the gift to your wish list. Distract yourself. As you stroll past Target’s One Spot or down the checkout line, you’ll no doubt be tempted by all kinds of holiday goodness. Look away. Engage in conversation with the people around you or sing silly songs with your kids. If all else fails, put your hands in your pockets and look but don’t touch! Keep your receipts. Hey, even Santa has an off day or two. You don’t have to be ashamed of buyer’s remorse. Keep receipts in a basket near your entryway and leave tags on anything unwrapped. If you look at something you purchased and think, why did I buy that? take it back. To enjoy your shopping season without paying for it later, be sure to create a Christmas budget. EveryDollar makes it easy to set amounts and track your spending as you go!